Here are some of the events for July and After-school registrations are open! Many Changes to After School Program. Including an optional extra class at 3 pm – Tumbling. •Summer Camp Until August 10th. •Download our App at your IPhone or Android and get our notifications! •Check in on Facebook and get a Sampa sticker by showing it at the front desk. •Enroll in The after-school Pick up and get a $100 off until July 25th. • Kids Competition Class 6pm – Mondays & Wednesdays – Elite Competitors only. 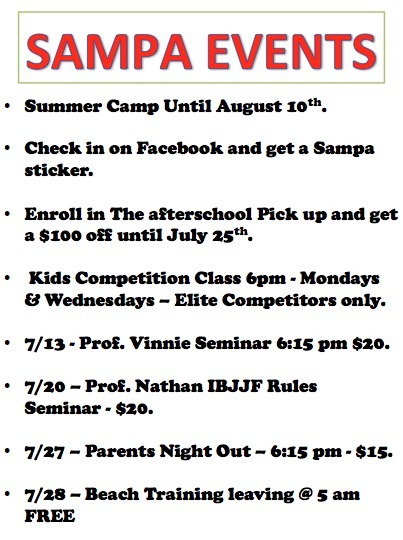 •7/13 – Prof. Vinnie Seminar 6:15 pm $20. •7/20 – Prof. Nathan IBJJF Rules Seminar – $20. •7/27 – Parents Night Out – 6:15 pm – $15.